When there is significant damage or breakage to the chains or sprockets, carry out the following remedies or replace with new chains and sprockets as necessary. 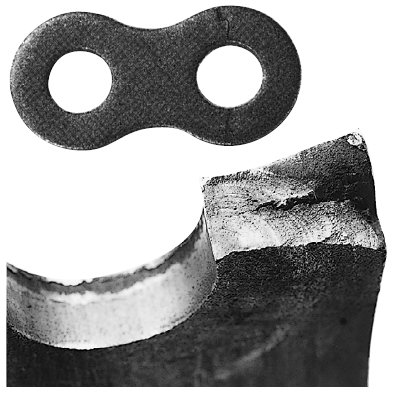 Wear on the inside surfaces of the link plates and sides of the sprocket teeth. Replace the chain or sprocket with the correct size. Decrease the load (and consider pump lubrication), or increase the number of strands or size of the chain. Replace with new chains and sprockets. Set angle to 120o or more, or for three teeth or more. Set or adjust the catenary and take-up. Tighten all bolts and nuts. Chain or drive area interfering with the casing. Replace the chain and protect the chain from the environment through lubricating or installing a casing. Chain is being pushed laterally. 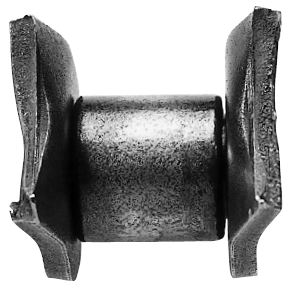 Remove the cause of the lateral forces and switch to a chain with guide rollers. Check the condition of the guide and widen the space between guide and chain. Remove the chain, clean, and lubricate appropriately. Reduce the load, or increase the chain size or number of strands. Foreign matter or conveyed goods caught in the clearances between pins, bushes, and rollers. Contact a Tsubaki representative to ensure that the clearances are appropriate. Replace with a new chain and adjust the installation. 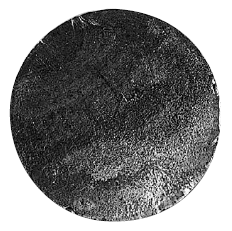 There is a load in excess of the fatigue limit (fatigue strength), causing fatigue from the inside of the plate hole and sudden fracture midway. 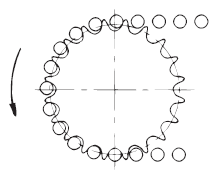 Increase the chain size or increase the number of strands. Replace with a new chain, protect the chain with a casing, and clean and lubricate your chain regularly. A load larger than the maximum allowable load is acting on the chain. Eliminate the overload or the excessive repetitive load, or increase the chain size or number of strands. A repetitive load is acting on the attachments. Ensure there are no overloads, or increase the chain size/attachment allowable load. Replace with a new chain, and protect the chain from the ambient environment with a casing. 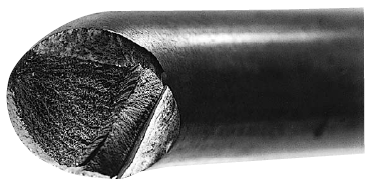 Consider specifications with greater resistance to stress corrosion fracturing. 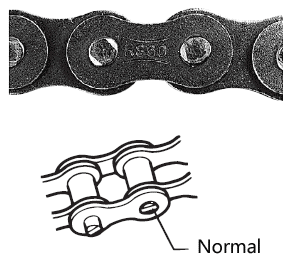 Occurs when a load greater than the chain's fracture strength acts on a chain in use. Eliminate the excessive repetitive load, or increase the chain size/number of strands. Use a casing, and clean and lubricate your chain regularly. When a chain is not lubricated properly under heavy loads, abnormal frictional force will develop between pins and bushes, causing the pins to quickly rotate. 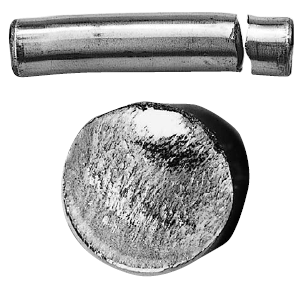 Operating a chain in this condition will cause the pins to extract and lead to chain breakage. Replace with a new chain immediately. Never weld the pins or reuse old pins. (Always dispose of old chains to ensure that they are not reused.) 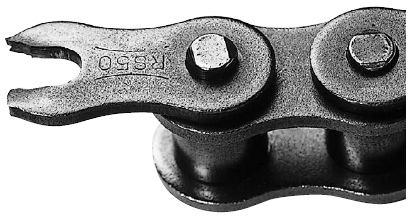 Check the mounting condition of the chain if the pin heads and plate sides are worn as well. Remove regularly, and use a casing to protect the chain. Lighten the load, or go a chain size up. Conveyed goods or foreign matter is accumulating in the frame. Remove regularly, and protect the chain with a divider system. Inner plate is moving inwards. Replace, reexamine installation, and reexamine load.